The Massachusetts Bill of Sale Forms are legal documents that provide proof that a sale and purchase transaction has legally taken place between a dealer and individual or two private parties. These forms will provide information with regard to the people making the sale as well as description of the item or items being sold and purchased. Some forms are required for registration of vehicle, boats, trailers etc… Some forms have to be notarized. If so, it’s recommended that the signing parties withhold signatures until a notary is present to witness the signatures of the participating signatories. General Bill of Sale – This form would usually be used to provide proof of sale and purchase between two private parties in the sale of personal items. Gun Bill of Sale – To be used to provide proof of an agreement to sell and purchase a firearm. This form will prove change of ownership. 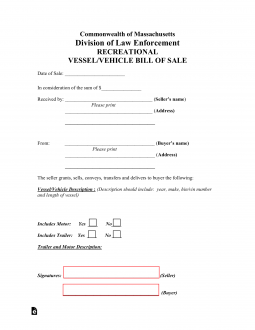 Vehicle/Vessel Bill of Sale – This versatile form may be used to purchase and prove a change of ownership of a motor vehicle or a vessel/boat, being sold and purchased. New vehicles – Manufacturer’s Certificate of Origin which must include date of the sale, odometer reading, purchase price amount, and the dealer’s original signature on the back side of the form. Complete a Registration and Titling Application. Proof of payment of sales tax. You must complete a Registration and Titling Application.